Flexure-guided and motion-amplified actuators and positioning stages provide convenience and performance for the OEM designer and scientist. Piezo actuators, a special form of electro-ceramics, are the gold standard when it comes to precision, speed, and force in a small package. To make them more accessible for the OEM designer, manufacturers package the actuators inside an arrangement of flexures providing precision guidance and amplified motion along with a simple mounting interface. Flexures are usually made of aluminum, steel or titanium. With the absence of friction and wear, they can provide billions of cycles of maintenance-free service. At the heart of piezoelectric flexure actuators is a stack of layers of specialized ceramic, only a few dozen microns thick, interleaved with electrodes, and sintered into a solid structure. The most common piezo ceramic for high-performance positioning applications is PZT (lead-zirconate-titanate), a ferroelectric ceramic. This material is useful for positioning because PZT ceramic exhibits a small, but almost linear dimensional change as voltage is applied across the electrodes. This provides a precise, controllable motion input to the engineer’s mechanism. Position changes on the order of nanometers can be achieved without difficulty. Piezo flexure stages come in many variations. Large units can handle high lateral forces for use in ultra-precision machining; miniature flexure stages are often used in optical metrology, disc-drive or semiconductor applications. All of them can provide extremely smooth and precise motion, free of friction, wear and maintenance. a) precision; b) speed; c) short travels; and d) high force. Multilayer piezo stacks. Spherical tips facilitate integration. The stack’s positioning precision comes from its almost-linear dimensional change, which is free of stiction effects and can allow controllability down into the sub-nanometer range. This is why piezoelectric mechanisms are at the heart of today’s semiconductor lithography tools, atomic-force microscopes, and the other nanoscale-precision systems. Its speed comes from the solid-state actuation of the stack, which propagates at the speed of sound through the material, yielding responsiveness into the kHz region, with correspondingly impressive force capability. The speed of sound actuation also means that piezo actuators can respond to an input in microseconds, a feature that makes them suitable to applications such as valve control and nano-dosing where nanometer precision is only infrequently of secondary importance. Its travel limitation comes from the maximum strain the actuators can achieve, typically about 1 percent of their length. Consequently, piezoelectric flexure actuators utilize frictionless lever amplifiers that magnify the actuator motion. Clever design means motion ranges of up to 2mm can be achieved in compact packages. 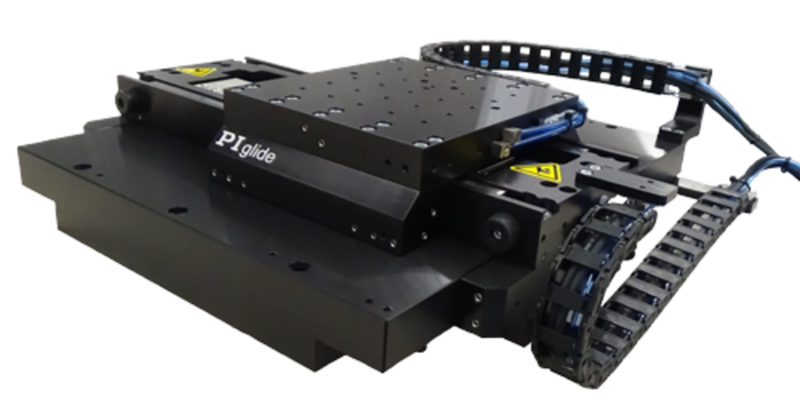 Until recently, piezoelectric flexure actuators have mostly been employed inside specialized piezoelectric stages for ultra-precision positioning applications and were not easily available to the OEM mechanical engineer. That has changed, and flexure actuators with long travels are now available as off-the-shelf items for ready integration into custom mechanisms. This new accessibility has opened the door for a wide variety of specialized mechanisms across a broad spectrum of industries. The latest generation multilayer piezo actuators are based on all-ceramic designs. They can handle high humidity environments, unlike their conventionally polymer insulated siblings. Central to the utility of piezoelectric flexure actuators is their range of configurations and their well-thought-out mounting provisions. These are easy mechanisms to integrate into a design. Everything has been considered: their integrated preload mechanisms accommodate even high-dynamic actuation; their optional position sensors are pre-aligned and reproducible; their flexure guidance accommodates common applications without difficulty. A wide range of controllers are available, spanning the spectrum of capability and cost. Some feature the latest communications interfaces, internal waveform-generation capability, all-digital servo-controlled including trimpot-free calibration, and integrated data-collection options, all in cost-effective, OEM-friendly configurations. OEM board-level piezo driver (left) and E-709 digital servo closed-loop piezo controller shown with a piezo flexure positioning stage for microscopy applications. The new piezoelectric flexure actuators complement and extend the existing portfolio of form-factors and packaging styles for piezoelectric actuators. Ceramic stacks – with or without integrated position sensors – have traditionally been available to engineers wishing to perform all integration. Packaged actuators have commonly been used for applications needing easy mounting and integral low-stiction preloads for dynamic actuation. 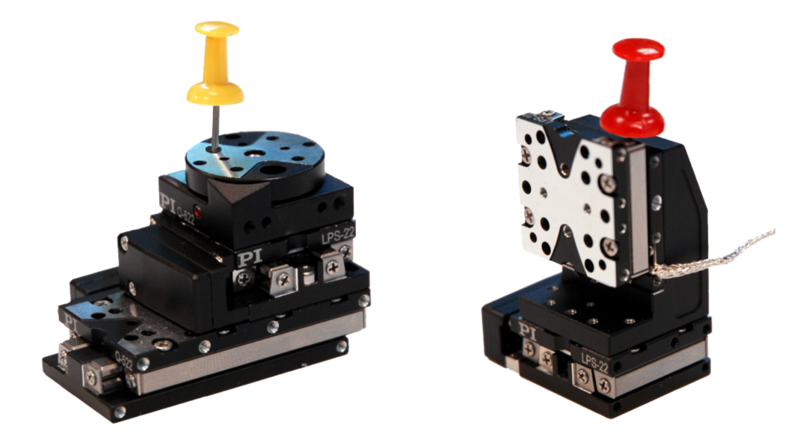 The new breed of fully integrated flexure actuators now offer preconfigured subassemblies which integrate stictionless lever amplification as well as preload elements and optional position feedback. Thus, piezoelectric flexure actuators offer especially easy mounting for the greatest convenience and performance for research and OEM applications, and they require the least specialized engineering to design-in and implement. Piezo flexure amplified actuators in different customization levels, from low-cost OEM actuators suited to drive micro-pumps to complete closed-loop nano-focus positioning systems. All of these choices share the common benefits of piezoelectric actuators, such as nanoscale precision, high speed and force, solid-state and lubricant-free actuation, non-magnetic and field-free operation, and vacuum compatibility. Flexure positioners are also available in multi-axis configurations. The most compact designs use a parallel kinematics approach, with only one moving platform, rather than stacking 3 individual elements for X, Y and Z motion. 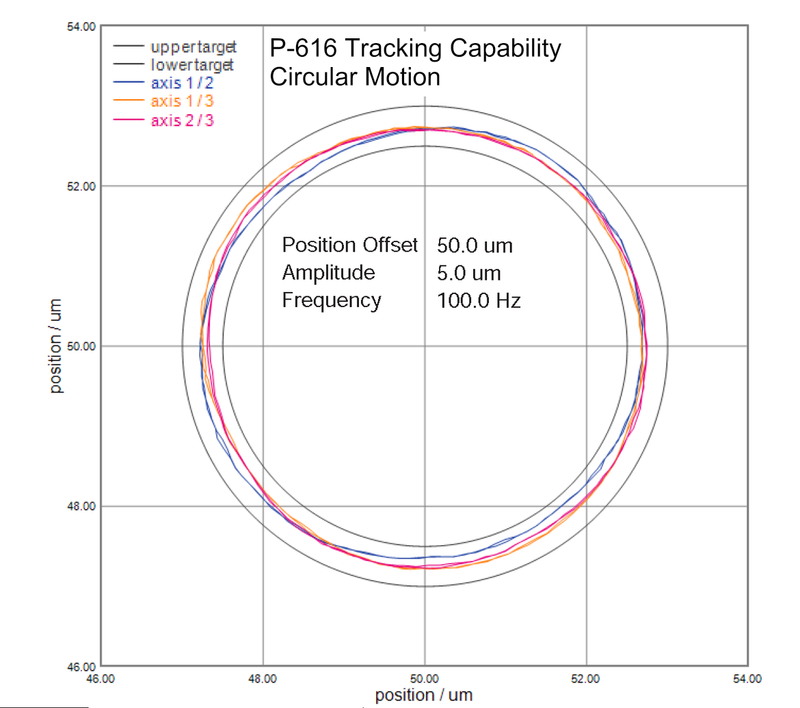 Excellent closed-loop tracking capability of the P-616 is shown in these two dimensional motion profiles. The graphs depict circles run at 100Hz in XY, XZ and YZ. 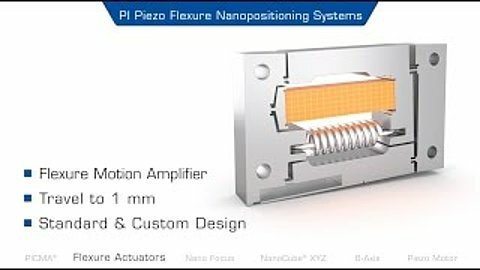 Piezo flexure actuators are used for precision positioning, as well as for moving things quickly, and for force generation. Force generation usually means pushing against an external elastic material. Piezo flexure actuator with a simple parallelogram flexure guiding system and motion amplifier. The amplification r (transmission ratio) is given by (a+b)/a. Force generation vs. displacement of an ideal piezo actuator (displacement 300 µm, stiffness 20 N/µm) working against an external spring. The points where the dashed lines (external spring curves) intersect the piezo actuator force/displacement curves determine the force and displacement for a given setup with an external spring. The stiffer the external spring (flatter dashed line), the less the displacement and the greater the force generated by the actuator. Maximum work is generated when the stiffness of the piezo actuator and external spring are matched. The additional motion provided by flexure-amplified piezo actuators does, however, come at a price. With increasing amplification ratio, both stiffness and responsiveness are reduced. Nevertheless, well designed piezo flexure actuators can still provide sub-millisecond step-and-settle times, significantly faster than any other conventional actuator. Resonant frequency is directly proportional to the responsiveness of the system. With the variety of parameters such as size, force, precision, travel range and cost, it is obvious that one flexure actuator cannot fit all applications. Often, a standard part may come close enough to be integrated in a prototype, however, for optimized cost and performance it usually pays off for the OEM mechanical system engineer to work closely with an experienced piezo mechanism manufacturer. Prototypes of custom designs can be prepared within as little as a few weeks. 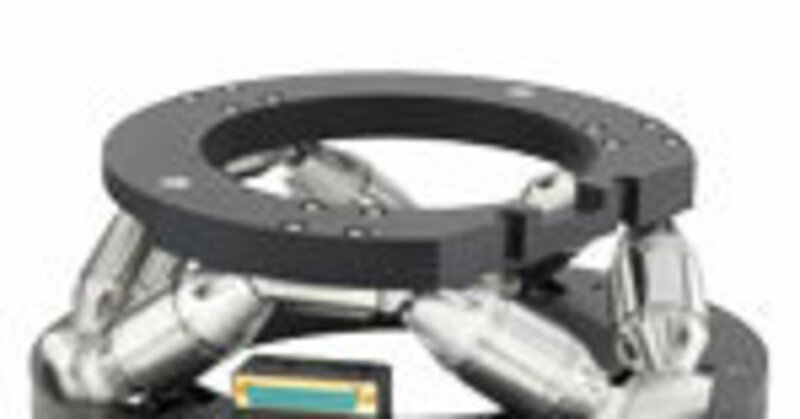 For multi-axis alignment applications, integrated piezo flexure stages with 6 degrees of freedom are available. Regardless of the form-factor, the latest designs of piezoelectric actuators are very reliable mechanisms. They must be, since they are the mission-critical heart of so many industrial and research applications, ranging from semiconductor fabrication to atomic-force microscopy. 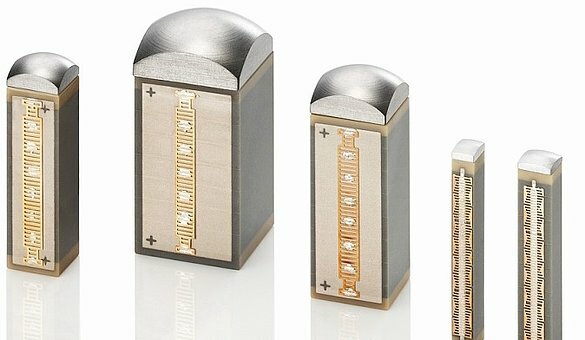 After all, they are structurally quite similar to ceramic capacitors, which are ubiquitous in electronics. However, they can be sensitive to humidity. Previously, PZT stacks were encapsulated by painting them with a polymer coating. This provided a small amount of protection against infiltration by ambient water vapor. 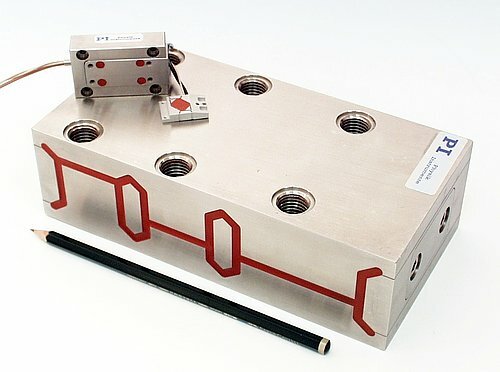 Far more effective is the patented construction of PICMA® model actuators – developed by Physik Instrumente (PI), which has played a pioneering role in advancing the development of piezo devices – incorporating a hermetic ceramic coating and many subtle design details which ensure long life even in the presence of high humidity. 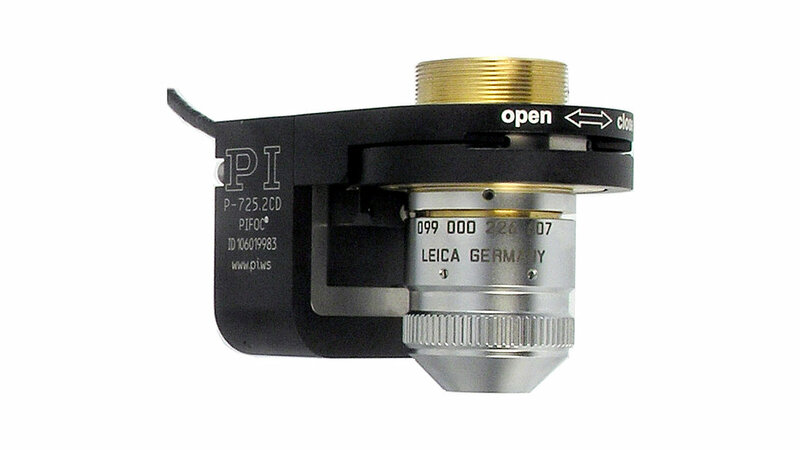 PICMA stacks are used in all PI flexure actuators. The solid state, frictionless design means wear and tear is not an issue when it comes to lifetime. Recent tests for space qualification of PICMA actuators have shown that even after 100 billion cycles the actuator performance only dropped by a few percentage points. See www.ncbi.nlm.nih.gov/pubmed/21507759. These actuators are now used in the Mars Science Laboratory on the Curiosity rover’s Chemln particle analyzer instrument. See http://msl-scicorner.jpl.nasa.gov/Instruments/CheMin/. 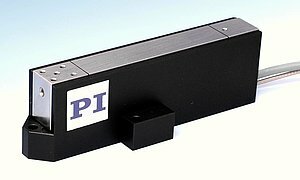 Different piezo motor driven actuators provide long travel ranges to 100’s of mm’s. Each of these piezoelectric tools extends the capability spectrum of piezoelectric motion – a spectrum which has expanded dramatically in breadth and depth in recent years. 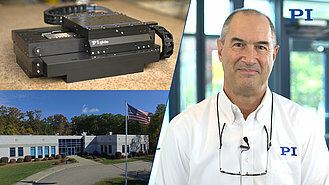 Piezoelectric flexure drives offer unmatched ability to drop into a custom assembly and provide fast, precise actuation without fuss and bother, and with demonstrated reliability to extend into the many billions of cycles. 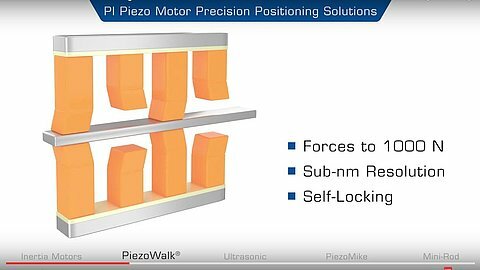 Recently-introduced piezo-motor technologies expand the use of piezo motion into long travel applications. Piezoelectric devices are increasingly being utilized by product designers and incorporated successfully into a widening range of applications where precision motion control is needed. These devices are compact, require low voltage, deliver high torque, exhibit short response time, generate little heat, are both nonmagnetic and vacuum compatible, and have few mechanical component parts to wear out and service. 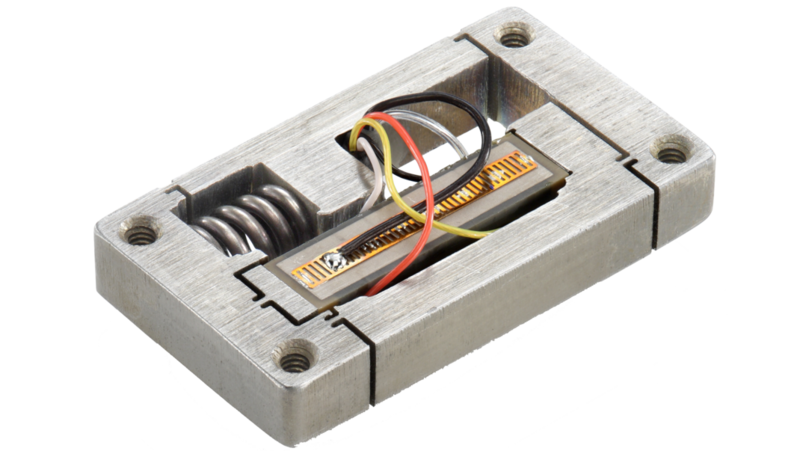 The latest generation of piezo mechanisms delivers an even broader product development capability for OEM designers. Authors: Scott Jordan and Stefan Vorndran, PI (Physik Instrumente) L.P.